Exceptionally roomy and bright and cheery are the adjectives most used when describing a stay in this property! Just steps from the sugar white sandy beaches of Miramar Beach! Sunday to Sunday rental during the peak season. Bring the family and have plenty of room to spread out. This 2BR/2.5 BA is spacious and roomy with plenty of privacy. The pool is just steps from your front door or you can be on the beach in just 2 minutes. Sun to Sun rental during the peak season. This 2BR/2.5BA unit is very spacious and roomy. It has been updated and has a fully furnished kitchen and wet bar area. Each of the roomy bedrooms have walk-in closets and their own private decks. Sunday to Sunday rental during the peak season. Just steps away from the beach, this spacious townhouse is cute with recently updated full bathrooms upstairs. 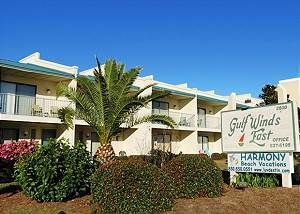 Gulf Winds East is located on a stretch of Miramar Beach that is not crowded with high rises. Sunday to Sunday rental during the peak season. Spacious and Roomy is the best way to describe these townhouses! Enjoy the ocean breezes from either of the 2 balconies or porches or take a short stroll to the beach. Sunday to Sunday rental during the peak season. The warm, sugary white sands of Destin's Miramar Beach are literally steps away. Enjoy the cool ocean breezes from either of the 2 decks and patios. At night, enjoy the HDTV with a Blue Ray Player! Sunday to Sunday rental during the peak season.